As the vets and vendors, the farmers and their champion cows head home from World Dairy Expo, held in Madison, Wis., The Why Files is still thinking about cheese. How is it made? Is cheesemaking a science, an art, or a mishmash of the two? Where it all begins: A cow donates her milk to a vacuum-operated milking machine at the World Dairy Expo. Those white tubes carry milk to a milk tank, just as they would at a farm. What is the cutting edge — in science, technology and marketing — of a product that could be older than written history? Cheesemaking was likely invented by people who stored milk in containers made from the stomachs of ruminant animals. These stomachs contain rennet, a mix of enzymes that coagulates solids and causes them to separate from the liquid portion of the milk. Those solids form curd, the first stage of cheesemaking. Curds are naturally acidic, and hence slower to spoil than milk. But what started out as a method to preserve milk has persisted and proliferated in the age of refrigeration, as many people find cheese irresistible. 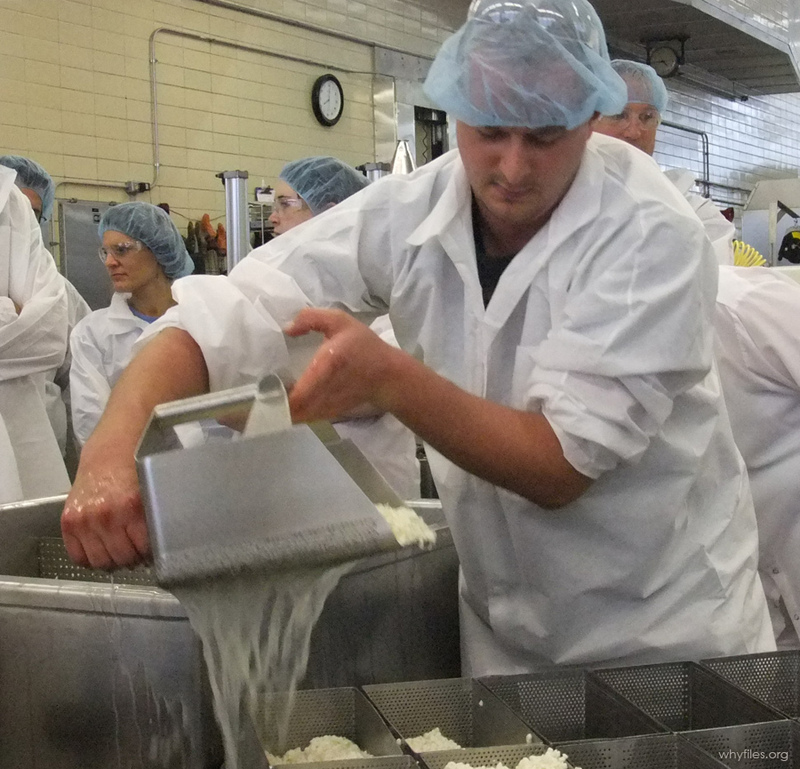 Separating curd from the liquid whey is usually the second step in cheesemaking. This brew, being strained at the Center for Dairy Research, will become mozzarella, the archetypal pizza cheese. We started Cheese-Quest, Why-Files edition, with a logical move: hoofing half a mile west to the dairyland within America’s Dairyland: the Center for Dairy Research at the University of Wisconsin-Madison. We lucked out. 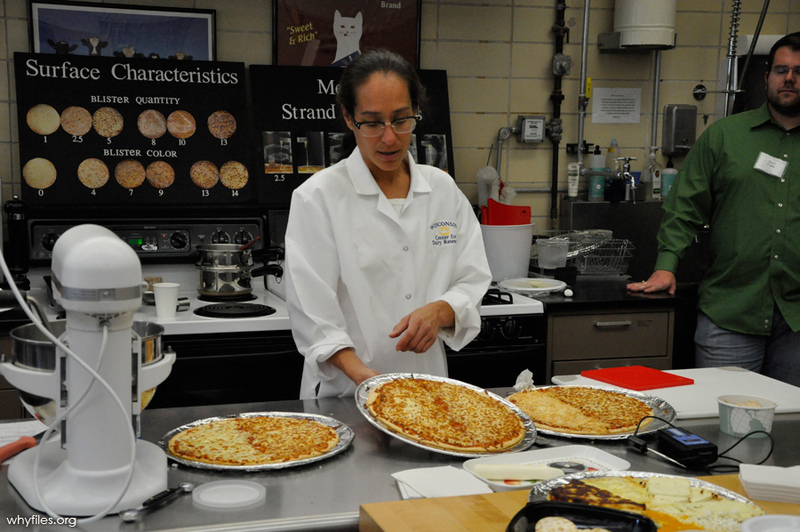 The center, one of six funded by America’s dairy farmers, was holding its semi-annual cheese technology short course, and we sat in on a class on cheese flubups, a talk about pizza cheese, and a hands-on cheesemaking session in the University’s dairy pilot plant. Carol Chen discusses browning, blisters and flavor on pizza with a class at the Center for Dairy Research. Cheese begins when fresh milk is acidified with chemicals or bacteria. Within hours, the milk solids coagulate into pellets called curd, and the liquid whey is drained off. 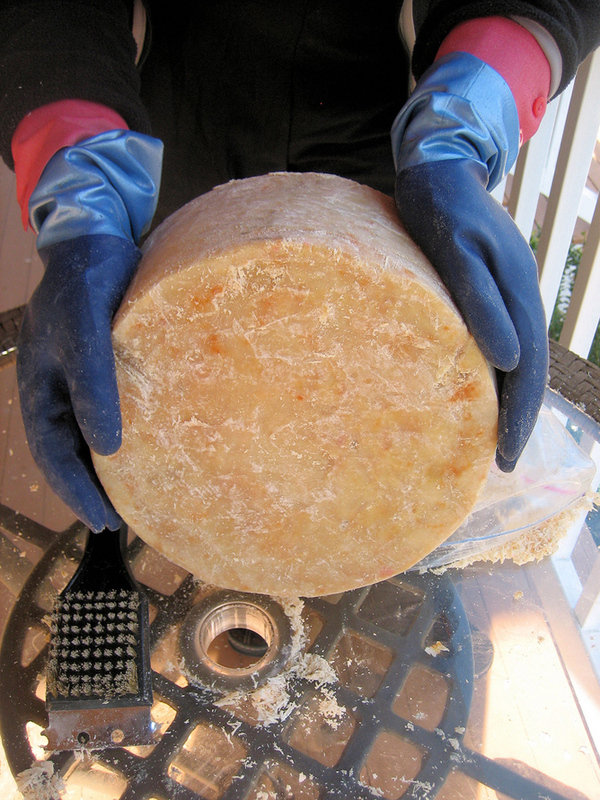 The cheese may be finished within in days (fresh mozzarella), or months or even years later after a long period of ripening in a cooler (aged cheddar, for example). 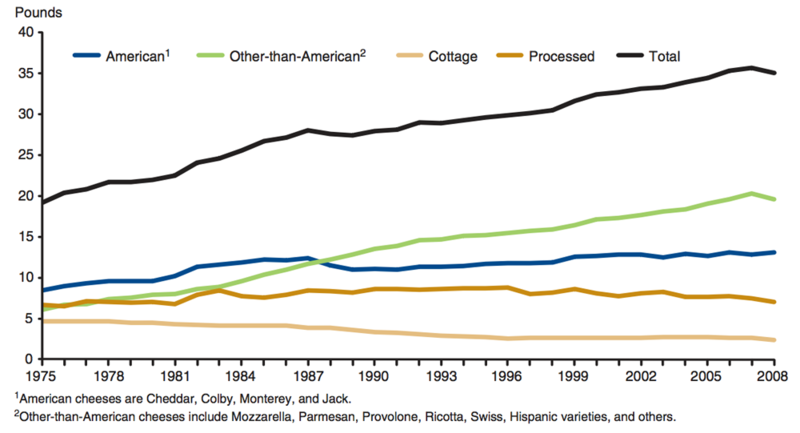 In the United States, slightly more exotic cheeses are gaining, as is overall consumption. Like a warm, white anaconda, fresh-extruded mozzarella emerges while a furtive cheesemaker sneaks a mouthful of the young cheese. While large dairy farms still rely on total mixed ration, the danger of erosion in hilly regions forces farmers to use more grazing, and the result is more flavorful milk, and more distinctive cheese. In hilly or mountainous areas, terrain may be too steep for growing crops. 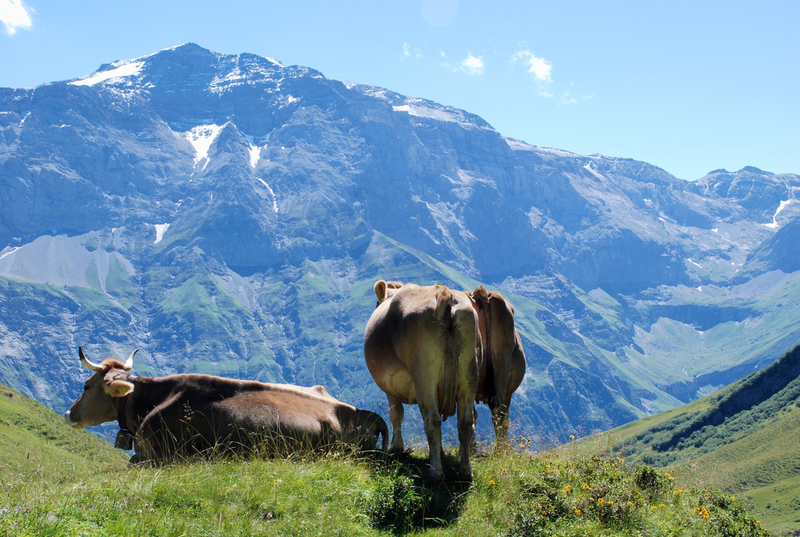 Cheesemakers say that grazing, such as these Brown Swiss cows in Switzerland, produces milk with more flavor than feeding corn and other row crops. Bold bacteria to the rescue? Cheese is a biological product, and the taste reflects its living ingredient: the bacteria that initiate acidification and then confer flavor. Thousands of strains of bacteria are on the market, “and they all make slightly different flavors,” Sommer says. And that’s not even counting the bacteria that arrive in the milk or sneak aboard in the cheese factory. “Without those other bacteria, cheese would be very mild,” says Mark Johnson, a scientists with the Center for Dairy Research. This cheddar, almost two years old, came from the Bleu Mont Dairy in Blue Mounds, Wis.
By analyzing DNA, Johnson has identified bacteria in cheese, and found up to a dozen strains — most of them accidental. “Usually, up to three strains are added, and everything else is native to the environment, the plant, or the milk,” Sommer says. On the flip side, finding funky strains that make off flavors could help in their elimination. Because cheese is a high-calorie food that normally contains considerable sodium, a factor in high blood pressure, the industry faces rising concerns about and obesity and hypertension. 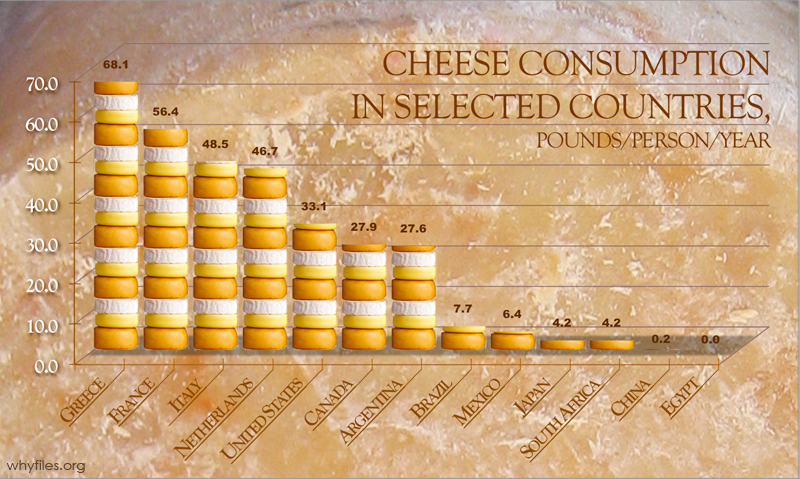 Cheese is mainly eaten in Europe and the Americas. The uneven consumption represents export markets for producers. 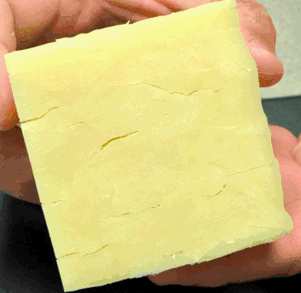 Bacteria created gas and those slits in this cheddar cheese. If the flavor is good, this cheese will become processed cheese; but gas formation still cuts industry profits. Pity the diligent cheesemaker. Johnson says plenty of problems arise after good cheese has left the dairy. Excess acidity in cheeses like cheddar and Colby turn it brittle, grainy and bitter. It stretches! 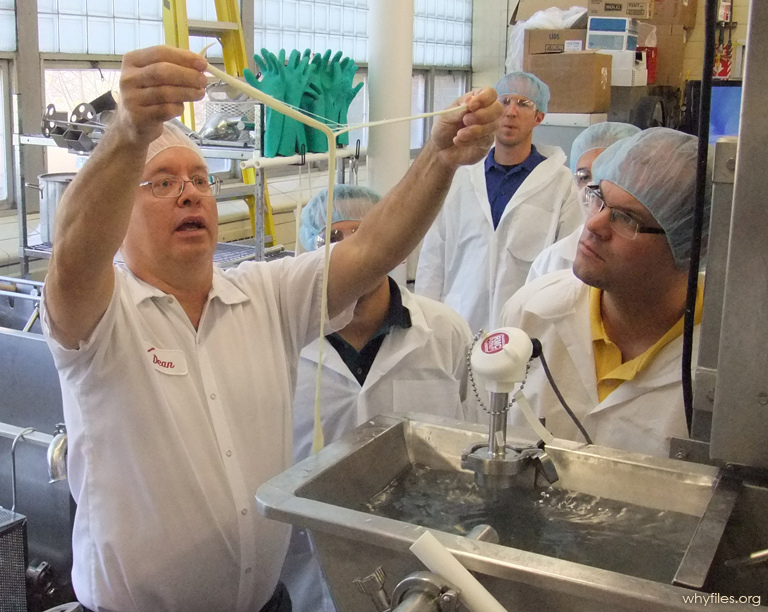 Dean Sommer, of the Center for Dairy Research, checks the stretch on some brand-new mozzarella cheese. Mozzarella gets its rubber-bandiness as the curd is mixed and proteins link together. Barbecue season approaches: What’s so great about open fire?